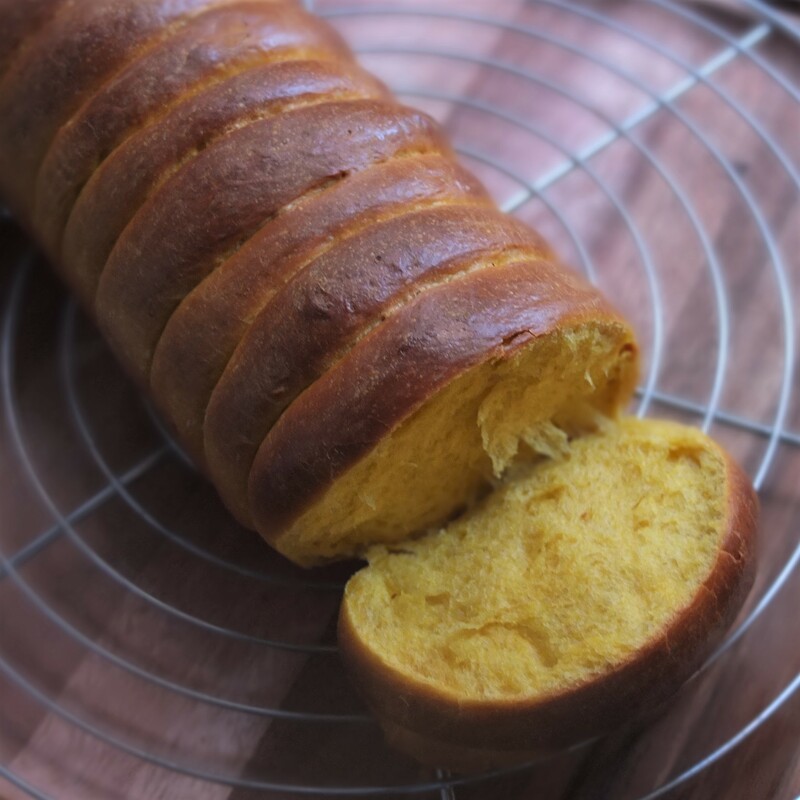 It’s wonderful to discover breads from different parts of the world like this fluffy pumpkin roti sisir. It’s fun to assemble and pull apart for slices. You don’t need a knife! 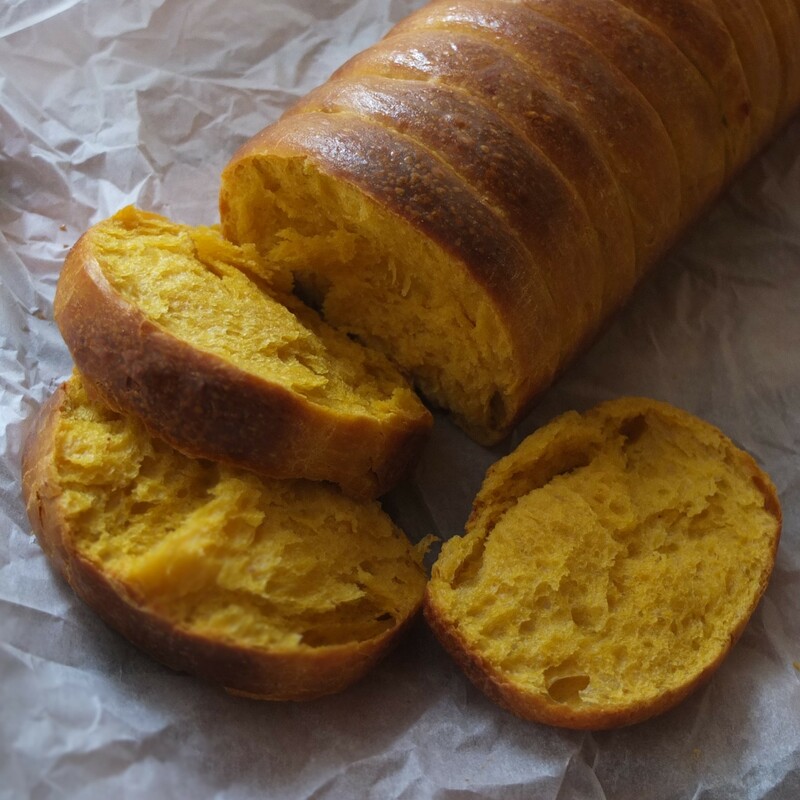 My sister-in-law who’s from there tells me ‘they love their fluffy pull-apart bread in Indonesia’ and you can read more about roti sisirs further down. 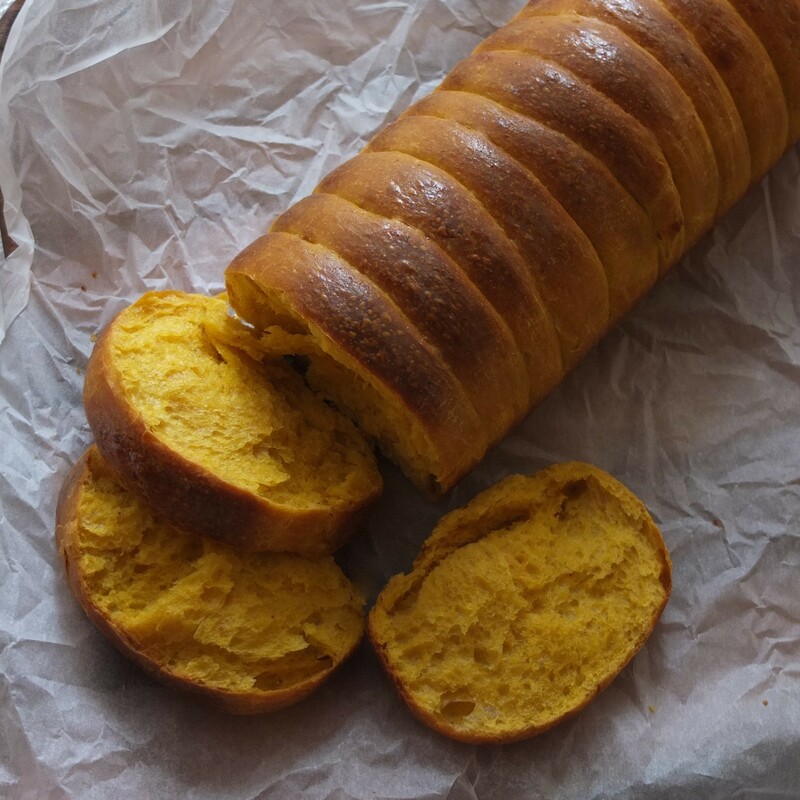 The flavour, colour and texture of this pumpkin bread are lovely. I’m so pleased I was inspired to try making it by the friendly homemadeloversss Instagram group based in Indonesia and Singapore. 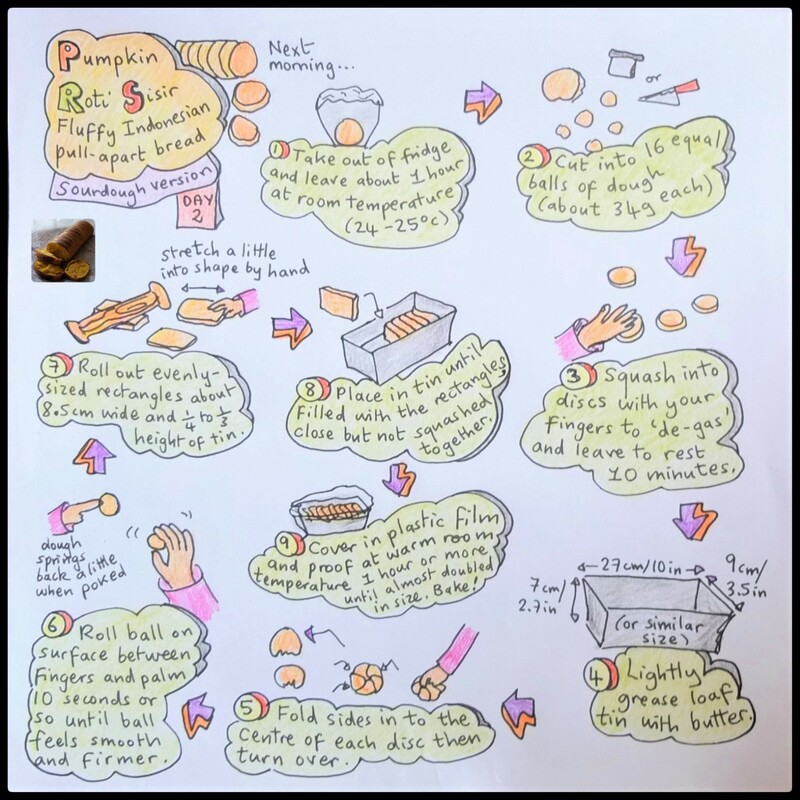 The first instant yeast loaf was adapted from one of the rare roti sisir recipes in English: Jeannie Tay’s Pumpkin Sweet Bread. I then converted the recipe to make a sourdough loaf with a natural yeast starter, which worked surprisingly well first time! Hurray! The sourdough version’s made with a young mild starter so it’s tasty but not sour. Both types of yeasted bread are very similar to French pain de mie, brioche-like pain au lait or British sandwich loaves. Slice of roti sisir amusingly pulled off by hand are delicious spread with butter or for sandwiches. Sourdough veterans may not take this loaf seriously – no holes, hydration percentages or heritage flours OMG the horror – but it makes a wonderful fluffy change and the slices present a lovely surface for spreadables. 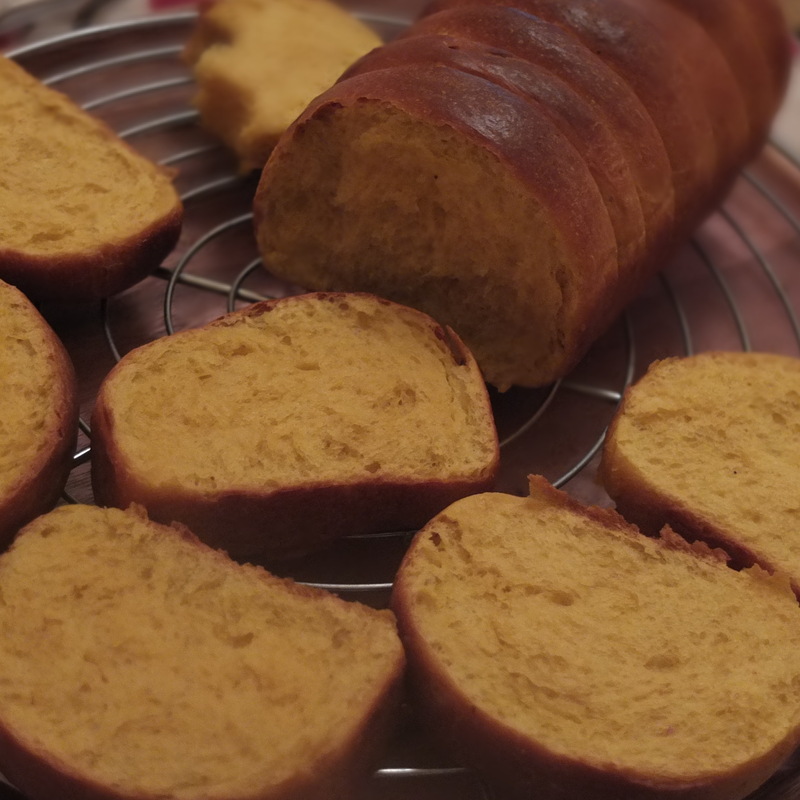 Jeannie Tay’s Pumpkin Sweet Bread recipe involves just one proof (after the dough is in the tin) but I prefer longer proofing and flattening after the first proof to ‘de-gas’ so there are two proofs here – techniques incorporated are those used for my pain de mie French sandwich bread and sourdough loaves. Instead of just bread flour a combination of bread flour and plain all-purpose or 00 flour is used. 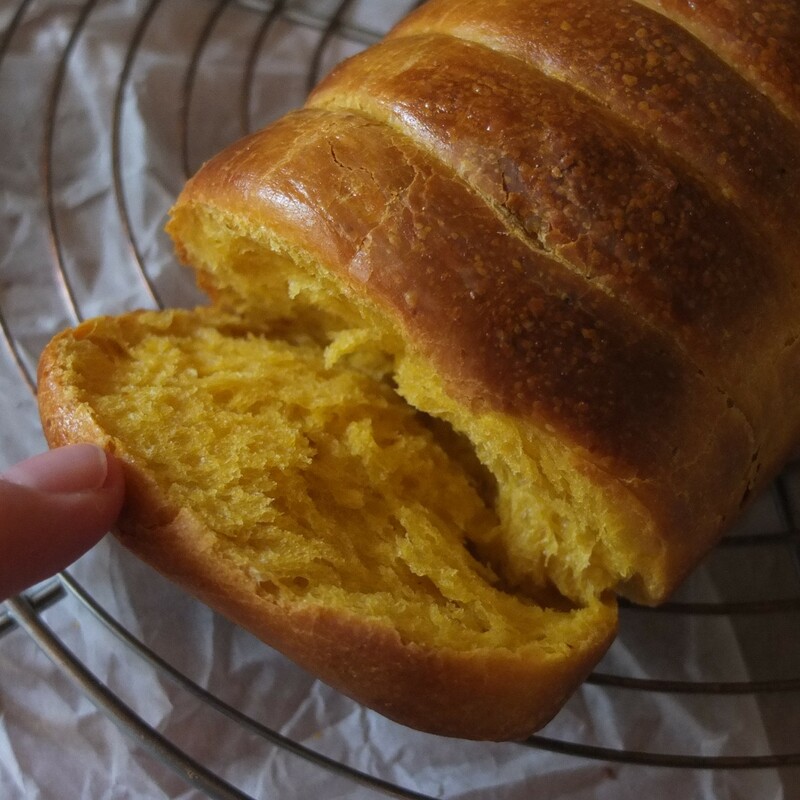 I thought the first instant yeast loaf could have more taste so for the sourdough version decreased the quantity of milk while increasing the pumpkin purée and salt. The instant yeast recipe is further down after the sourdough version. Note: don’t worry if you don’t get full window pane effect. It’s possible the pumpkin purée adds a bit more moisture making full stretch less likely. The ball of dough stays a little sticky – if your dough’s very sticky add a teaspoon or 2 of flour and knead 5 more minutes but you don’t want a dry dough. When rolling into a ball don’t flour the surface (or flour very very lightly) or you won’t get the traction needed to shape the ball under your fingers and palm. 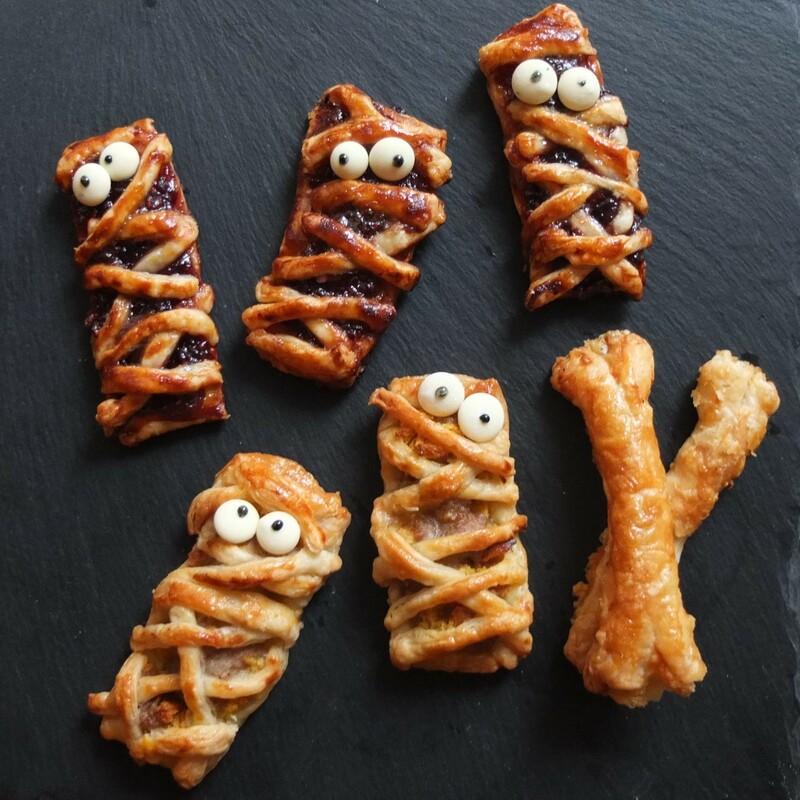 You can flour your fingers a little. After 1 hour or so when the dough has almost doubled in size in the tin, preheat oven to 170ºC/340ºF (fan/convection) or 190ºC/375ºF (static oven). Test if the dough is ready by poking slightly with your finger. If dough springs back immediately it hasn’t proofed enough. If it doesn’t spring back at all but just leaves an indent it’s on its way to overproofing so get in the oven quickly. If it springs back slowly and just leaves a slight indent it’s ready. Brush the top with a little beaten egg. Bake 20 to 30 minutes until golden brown. Once out of the oven unmould immediately and allow to cool on a wire rack. Pull off a slice just for fun and to double check it’s all good in there. Eat warm or store at room temperature in airtight tupperware 1 – 2 days. It’s still fine a few more days but starts getting drier. Slices freeze well up to 1 or 2 months wrapped tightly in plastic film (maybe in environmentally friendly bees wax paper?) or in airtight tupperware. My favourite topping at the moment is a nice layer of semi-salted butter. And I have dreams of a ham and cheese sandwich. Yum. 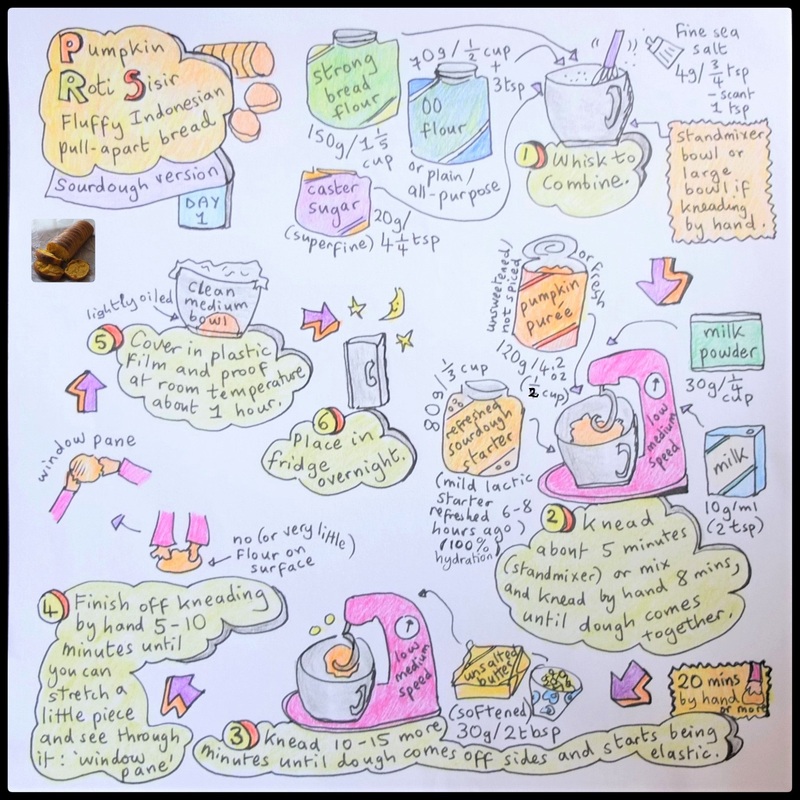 Note: for a more pronounced taste try 120g pumpkin purée, 10g/2tsp cream or milk and 4g/3/4 to 1 tsp fine sea salt – these quantities worked for the sourdough loaf. The process is very similar to the sourdough version but some timings differ. Whisk dry ingredients (flour, sugar, milk powder, salt and instant yeast) together in a big (standmixer) bowl, to combine. Add the pumpkin purée, egg and cream or milk. Knead with dough hook on standmixer for 5 minutes until dough comes together. Or knead by hand 8-10 minutes. Add in softened butter. Knead with dough hook 10-15 minutes (20 minutes or more by hand) until the dough starts to be elastic. Finish off kneading by hand on a flat surface (not floured, or with very little flour) about 5 minutes until almost at ‘window pane’ – when you stretch a little piece it becomes so thin and almost transparent you can see through it. The dough could still be a little sticky. If it’s very sticky gradually add a teaspoon or two of flour and knead 5 more minutes. But you don’t want a dry dough. Make a ball. Place the ball in a lightly-oiled medium-sized clean bowl. Cover with a shower cap, plastic film or lightly damp tea towel. Proof 1 hour at room temperature (about 24-25ºC/75-77ºF) – time and temperatures are flexible. 1 hour later: follow the instructions above for shaping, proofing, baking, eating and storing as for the sourdough version. Roti sisirs come in various flavours like matcha, chocolate or cheese. 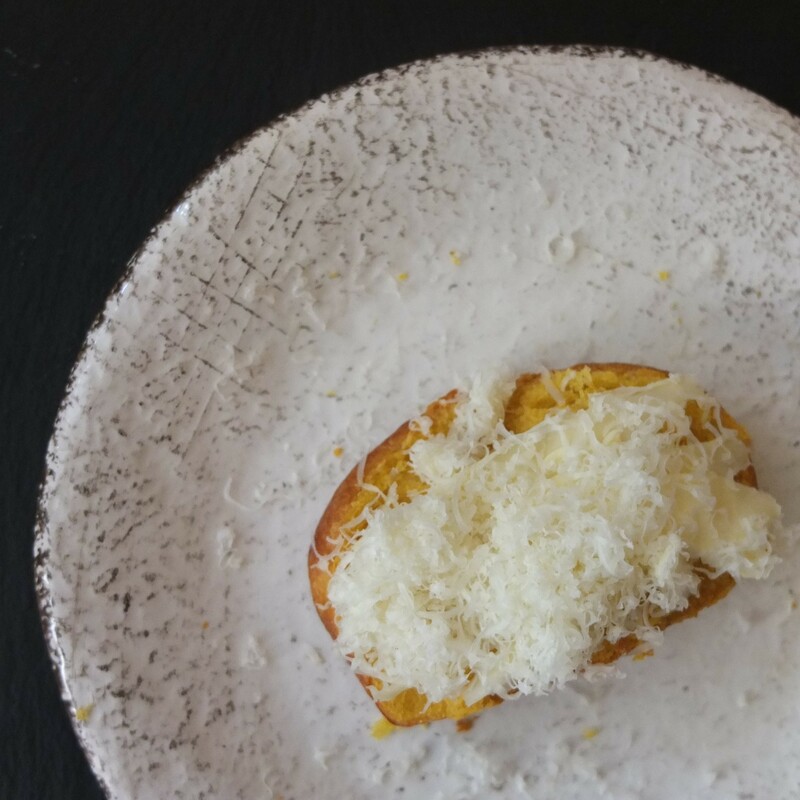 Grated fillings can be added between slices when placed in the tin. And you could try using the shaping technique for your own bread or brioche recipe just for the fun of pulling slices. No worries if they’re a little uneven. I was really interested in researching roti sisirs but my google search results all came up in Indonesian. Major stumbling block. Further digging revealed ‘Roti‘ is the Indonesian word for bread. Wikipedia gives examples of different Indian rotis (many of them flatbreads) but it doesn’t provide much info on Indonesian rotis. ‘Sisir‘ is the Indonesian word for comb and I suspected this describes the many lines going down the bread spaced out like a comb. My sister-in-law confirmed this and on instagram some roti sisirs are tagged #breadcomb. 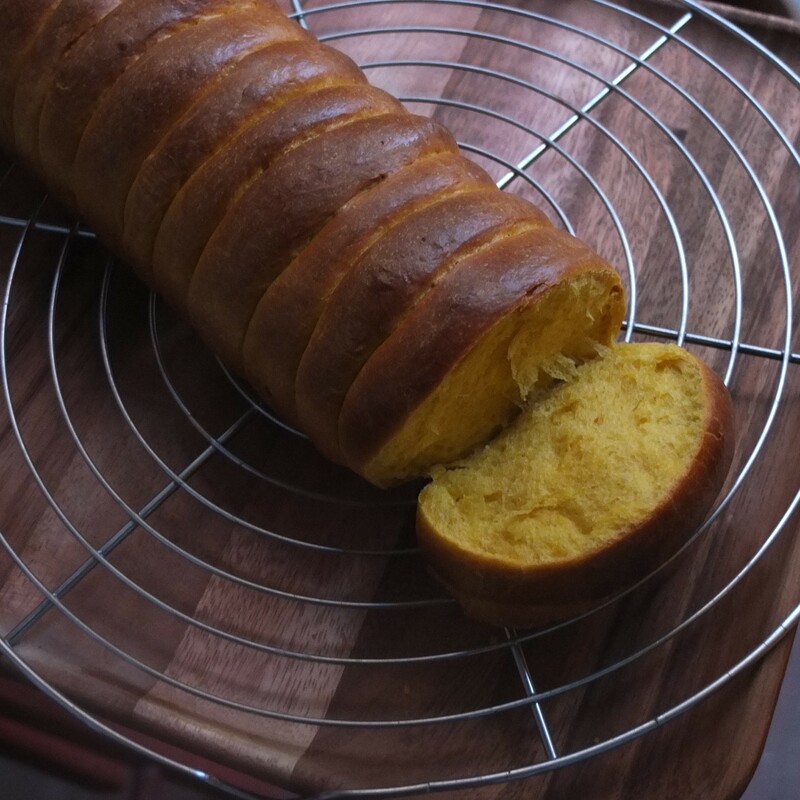 Sister-in-law also says these kinds of breads have been around Indonesia maybe not hundreds of years but a while. She remembers them when she was young but they weren’t found in poorer places. Generally rice is still the main sustenance at daily meals there so breads are considered a snack and more available at bakeries in bigger cities and towns. But do let me know if you have more info on roti sisirs.